Listen. There’s something padding down the wooded trails, bubbling over waterfalls, and rustling in the pines. No, not your meditation app. 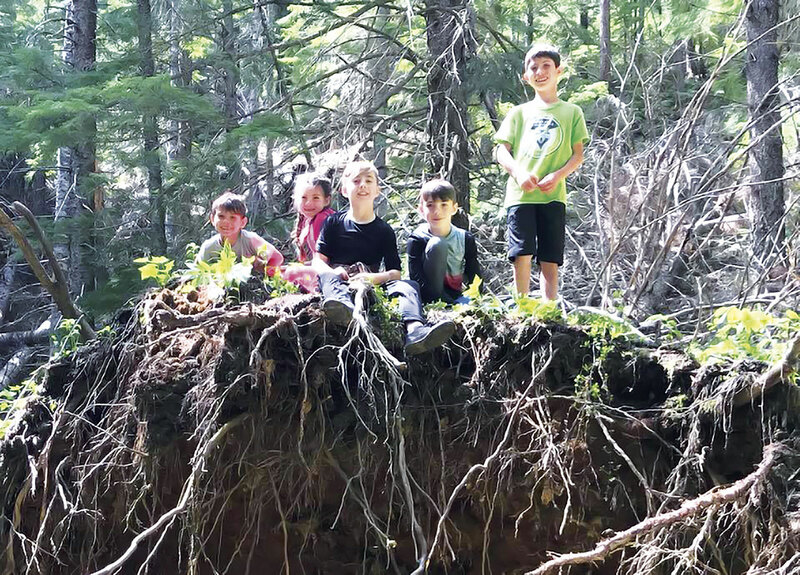 It’s an international movement called biophilia and you can hear it blooming in the voice of a busy little girl at the Into the Forest Outdoor Learning Center and Preschool in Spokane Valley. The three are playing in a big fenced yard, complete with vegetable garden, where a dozen or so other children scamper on tree stumps, roll tiny pumpkins, and scavenger hunt for colors. There’s not a cry or whimper among them. Children explore the woods during a camping trip. Co-owners Megan Benedict and Chelsey Converse opened the center—Spokane’s first outdoor preschool—in August 2017 and within a year, classes were full with a waiting list. A second preschool will open this March. Similar stories are unfolding all over the world, as children leave desks behind to spend days outdoors interacting with nature, running, playing, and studying science in the wild. Biophilia, our innate affinity for and connection to nature, is not only for children—parents, too, are taking time from hectic schedules to unwind with meditative forest bathing, and many doctors now prescribe visits to the park instead of pills. Much of the credit goes to Richard Louv, whose 2005 breakout book, Last Child In The Woods: Saving Our Children from Nature-Deficit Disorder, detailed the costs of alienating ourselves from the natural world, especially with today’s pervasive use of technology. Though nature deficit disorder is not a true medical diagnosis, restoring our connection to a living green biosphere has been shown to enhance health, well-being, mental acuity, and creativity, while also reducing stress, depression, and obesity. It’s an idea that Washington State University 4-H adventure education director Scott VanderWey has embraced for years as part of his mission “to get as many kids outside as possible.” Stationed at the Puyallup Research and Extension Center, VanderWey helps county 4-H leaders develop ropes courses as well as programs in rock climbing, boating, skiing, and rite of passage wilderness training. He says it was Louv’s work that led to the 2008 creation of Washington state’s pioneering No Child Left Inside (NCLI) grant program, which is managed by the state recreation and conservation office. As one of the founding NCLI board members, VanderWey reports that the program has already provided $5 million in funds to get kids outside for unstructured play. Organizations in every part of the state have benefitted from the grants including the Tiny Trees Preschool in Seattle, Waskowitz Environmental Leadership Service in Burien, and the Spokane Parks Rx Outdoor Adventure Camp. VanderWey says NCLI has also inspired a tremendous growth in outdoor schools with at least half of Washington counties now offering some form of outdoor preschool. Getting kids outside is nothing new to Jeff Sanders, WSU associate professor and environmental historian. He says the idea of a nature deficit goes back at least 150 years to the Industrial Revolution, when many Americans left rural areas for work in Chicago or New York along with a large influx of immigrants. If the children weren’t helping in factories, they were often left to fend for themselves on the streets. Fearing for the youth’s health as well as the future of our nation, social reformers advocated for changes that led to the playground movement of the late 1800s. Around the same time, summer camps reached their heyday, and the Boy Scouts of America was established. The first “streetcar suburbs” also took root, where people with means could escape grimy cities for more leafy areas like Brookline, Massachusetts. The contented little fellow playing in the vegetable garden at Into the Forest Preschool would certainly agree. Though a single frost-blackened sunflower now remains, the children had grown and eaten potatoes, carrots, tomatoes, and squash throughout the summer. For them, nature has become an integral part of their daily lives whether they’re digging in the sand box or rolling a big wooden spool under the open sky. 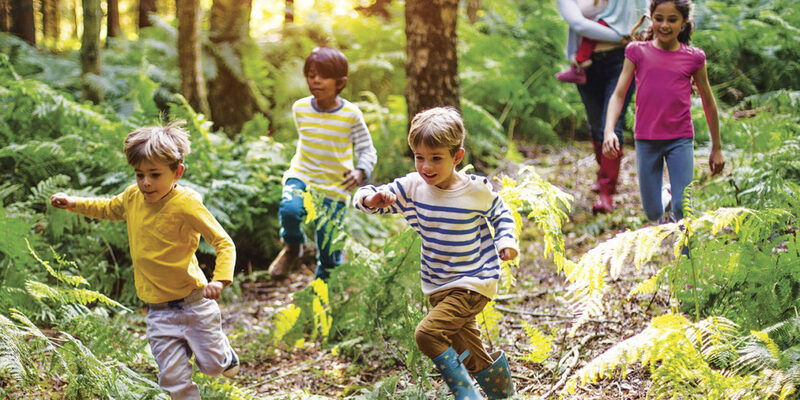 Unfortunately for many children, carefree days playing outside are a thing of the past, says WSU clinical assistant professor of human development Robby Cooper. Today, a child seen walking to the park alone might well trigger a call to police and a warning to parents. Cooper says Richard Louv blames this phenomenon on an increasingly fear-based society. Although statistics show crimes against children have dropped to their lowest rates ever, social media and 24-hour news cycles can make it feel like every abduction is happening in our backyards. So now, instead of exploring, making up games, or riding bikes to local parks, kids spend much of their freetime indoors using tech devices and staring at screens. Cooper says all this screen time may affect attention span and leaves little room for imagination and creativity, things research suggests are important for brain development and learning. Today, children worldwide are more likely to experience that sense of wonder as urban planners bring natural elements and green spaces into modern designs for cities, schools, and playgrounds. The biophilic spaces they create provide access to nature through green streets, wildlife refuges, parks, trails, bike paths, and more. Some architects take playground design a step further by incorporating hills, valleys, mountains, and hideouts. “Once kids get outside, there’s a way in which nature calms the body,” says VanderWey, who struggled with dyslexia in high school. It was through a WSU-sponsored challenge course that he developed self confidence and found his professional calling. Now, his efforts with 4-H and No Child Left Inside enrich the lives of thousands of other Washington children, many of whom are low income and would never otherwise experience outdoor adventure. VanderWey says Inslee’s strong commitment to NCLI not only makes Washington a national trailblazer, but ensures that our young stewards of the future will continue to enjoy Northwest deserts, ancient forests, and the salty spray of the Sound.